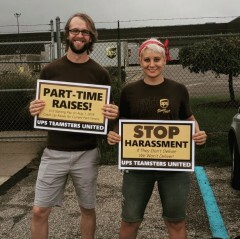 How to vote “no” on the Teamster, UPS contract this September | Fight Back! Chicago, IL - Voting instructions will arrive in the mail as soon as Sept. 10, for over 200,000 Teamsters affected by the proposed 5-year National Master UPS Agreement. The only two UPS locals not in the agreement are Local 705 and Local 710, which are currently still in negotiations. Signed by the Teamsters UPS National Negotiating Committee June 21, the master agreement was ratified August 9 by representatives of every affected Teamster local. A large faction voted against ratification, including seven international vice presidents and numerous large locals. Angered over weak raises, particularly for part-timers, a new two-tier wage system for drivers, and giveaways to subcontracting in feeders, among other issues, UPS Teamsters across the country are mobilizing to reject the agreement in large numbers. “This agreement doesn’t reflect the billions in profits UPS is making every year. Even worse, it includes concessions. We can win record improvements, but only if we vote ‘No’ this September,” commented Bill Aiman, Tampa, Local 79. In the mail, Teamsters will receive a packet, containing instructions on how to vote, a sample ballot, and a handful of propaganda by the Hoffa administration, which is working hand-in-hand with management to sell a ‘yes’ vote. The vote may be conducted via phone or internet using BallotPoint, so instructions will include an individual anonymous access code. BallotPoint is an independent service that conducted nearly 4000 union elections since 1999, according to their webpage. Every Teamster will be able to vote once on the National Master Contract and once on their regional supplement. Some locals with local riders will have a third vote. The voting period will take place for 21 days and will be counted in October. If a ballot is not received after being out for seven days, the local union must be contacted for a new ballot.